There is nothing more fun, lighthearted and inviting then the image of a beautiful woman wearing roller skates. The image is automatically iconic of all that is carefree, summer, easy going and enjoyable. And there is nothing that signals more ominously of impending dread and tension than the back fin of an approaching shark lurking just above open waters. Nothing more horror striking to the human heart than the image of a sharks open wide jaws, dripping with blood posed for destruction. My work pares these seemingly opposing visual elements to illustrate the realities of my concept of life. Both pictorial elements are creatures of motion. Roller skates being vehicles of fun, leisure recreational choice and shark momentum being an act of life sustaining necessity. Life is constantly in motion, giving us circumstances of joy and pain, frivolity and stress. We react with acceptance, ambivalence or resistance. It keeps going and we keep going and we choose how we keep going. Life is sometimes the beautiful fun roller skating woman, and sometimes we are. Life is sometimes the vicious shark and sometimes we are. Most of the time life and our relationship to its circumstance are an ongoing symbiotic relationship of the two. Wrestling, struggling, enjoying, embracing, resisting its ebb and flow. The process leaves us sometimes, bloody and a mess, torn up and missing parts of ourselves we once had. We learn to keep going, moving, living despite the gravity of past wounds, or possibility of future infliction. We embrace the battles that have scared us and made us as well as the memories of joy that sustain us through the struggles, and hold hope for future experiences of happiness. We keep moving, going. living. The work of Betsy Barratt is continuously at the edge of opposing forces. Beauty sits next to violence, homemaking resides with alchemy, nature confronts plasticity. Her explorations of the dichotomies of modern femininity are at once shocking and sublime. This “Shark Girls” sequence sets the lively and youthful act of roller-skating against the trauma of a shark attack. This dualism of shattered youth and amputated ideals is an ongoing theme in Barratt’s work. Each of the “Girls” in the series are in states of undress, with comehither and near-emotionless expressions; these girls are expected to be demure and placating, their beauty is their primary worth, they are having light-hearted and nonconfrontational fun with their skates on. They are objectified. 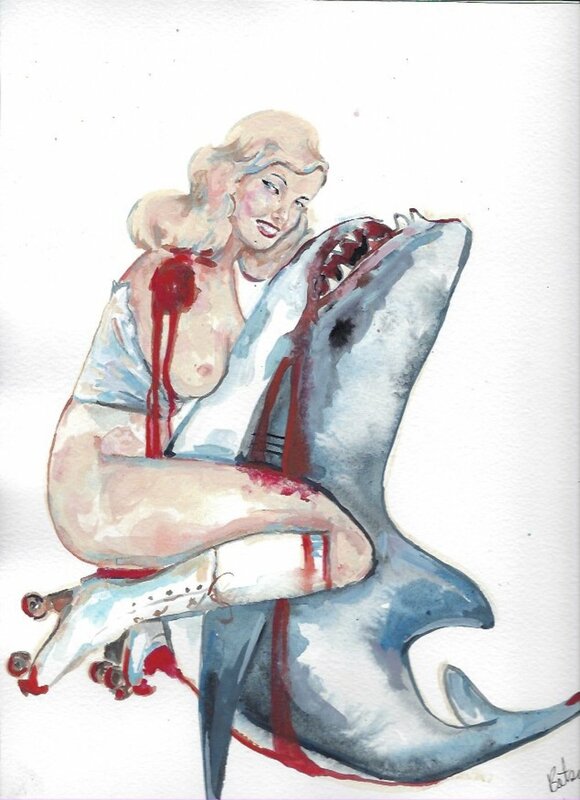 Barratt brings the “Sharks” into these appropriations of the feminine experience, at once serving to show the inner turmoil lady-like behavior creates and more overtly displaying how girls are victimized by the world. This clashing of carefree joy and anxious dread is further heightened by the sexual energy which exists between each shark and girl. The intimacy suggests a form of consent, unpacking the modern woman’s need to please that which easily could destroy her. This creates an unsettling relationship which speaks to the need of pain and confrontation for fertility and union to occur. Both pictorial elements also are creatures of motion. 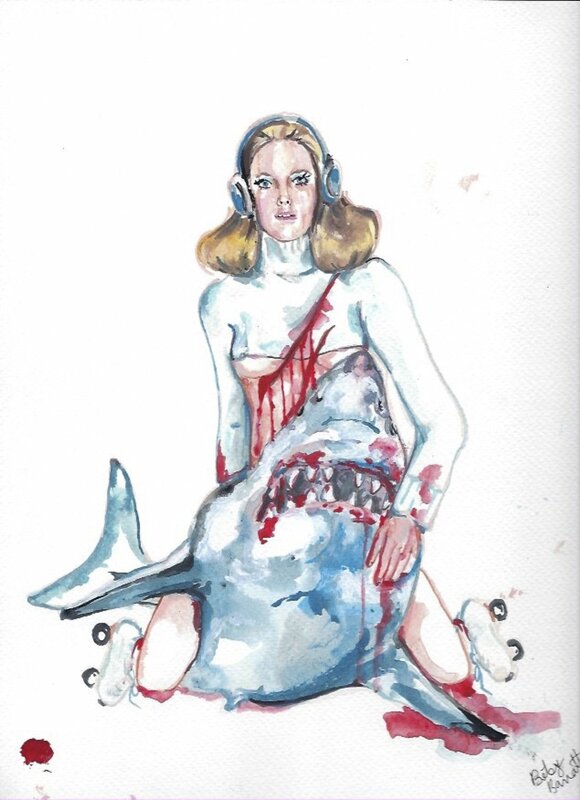 The girl moves quickly on her wheeled skates, but not fast enough to escape the horror and tension of the shark’s gaping jaws. At the intersection of these figures, at the moment of connection, is bite and blood. The women seem to revel in their own blood and confront it fearlessly, even to caress and cuddle with the violent and ancient sharks. The images are at once a destruction and an empowerment of women. Made on a small scale and with Gauche, the paintings make stark use of negative space. The series invites the viewer into an immediately intimate and stressful dynamic and suggests that the totality of experience occurs in an absurd and context-less reality. Barratt’s work exemplifies the notion that life is forever unstoppable, that one must embrace pain and injury through beauty and stoicism; and that life, the girl and one’s own self must persevere, must keep moving, and must struggle through the pain.